YoYoStringLab - Great String. Great Shirt. A great yo-yo can't really perform without a string, and a great yo-yo player can't really perform without a shirt! 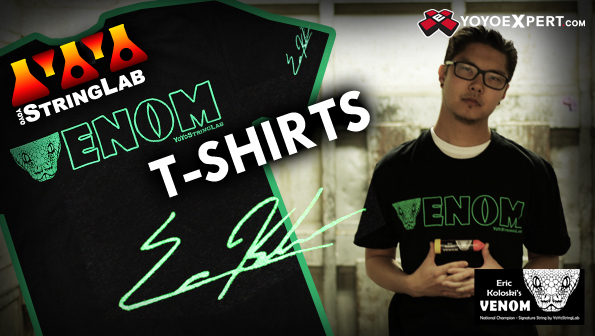 YoYo String Lab is proud to present the all new Venom T-Shirt! The Eric Koloski signature Venom is an excellent string and it's one of our favorites; it holds tension well and has the perfect thickness and weight for slacks and whips. If you're a fan of Venom and a fan of shirts, then this is for you! This t-shirt has the cool Venom logo printed in bright green on an extra soft black Next Level tee. Now you can look good and stay comfortable while repping your favorite string! The first 5 customers to purchase the Venom T-Shirt with any pack of Venom String will receive one free tube of Neon Yellow Venom String FREE!